While Felkerino and I started our bike tour, the rest of the Washington, D.C., metropolitan area cyclists made their way down to Salisbury, Md., to ride the Seagull Century. OK, not everyone, but a large number of them. I’ve never participated in this event, but it sounds like an EXTREME social gathering on bikes. According to the Seagull website, over 8,300 people participated in the 2009 century. Yikes! That is a ton of people! 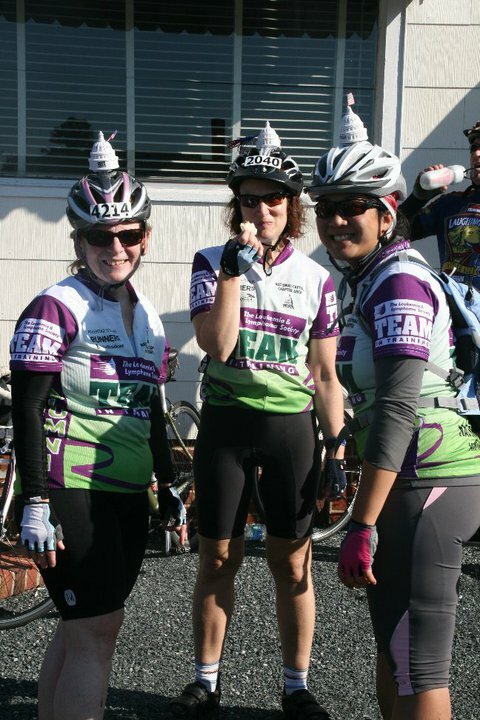 My cycling friend Leyla was at the Seagull this year (which took place October 9, 2010), and mentioned to me that she would be wearing a Capitol Dome on her helmet during the ride. What? A dome on your helmet? Now that’s not something I see every day on my commute. Actually, I’ve never seen anyone riding with a Capitol Dome on their helmet, on my commute or otherwise. I like it (although wearing it might diminish a person’s image as a “serious cyclist”)! Thanks for sharing the photo, Leyla, and I hope everybody who rode the Seagull Century had a great ride. At least, the weather finally cooperated this year! Have you met my flickr friend, Pedro Gringo? Extreme social gathering is an apt description. The ’09 edition was my first century ride and the precursor to my budding randonneuring career. So I felt compelled to return, and took my brother this time. We had a great time and saw the group with the Capital domes on their lid. Hey Mike, that was the weekend you did the back-to-backs, no? An extreme social AND cycling weekend for you!